Dean - king of the (sometimes) witty one-liners! And it's only the words, it's also the way Jensen conveys those lines to the audience that makes them so unique and remarkable. I'm gonna go for the drama again, as usual. That is the premise of Supernatural and the primary force in Dean's life. He only exists to take care of Sammy. I adore the codependancy, and in my head canon and fanfic, I go back and forth about Sam's feelings in this. Sometimes he's equally needy for Dean (Wincest stories) and other times he's staying with Dean for Dean's sake (Destiel stories) and will gladly make his exit a bit when Dean has someone else to love and join at the hip with. The crux of Dean's character is that he can't be alone and he's been damned from before birth to a life without many people. He's a very social creature, who's had to put all his need for people into the few he can trust/must protect. Basically, it all comes down to Sam for him. He's tried to kill himself at least four times (sell his soul, Croatoan, darkness sickness, red meat) when he was certain Sam was dying or dead. 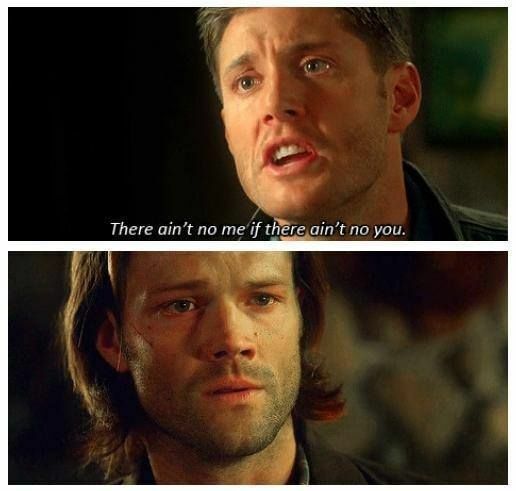 Yeah, without Sam, Dean will be no more. I also enjoy reading your answers and those of the others. His delivery is what sells these.